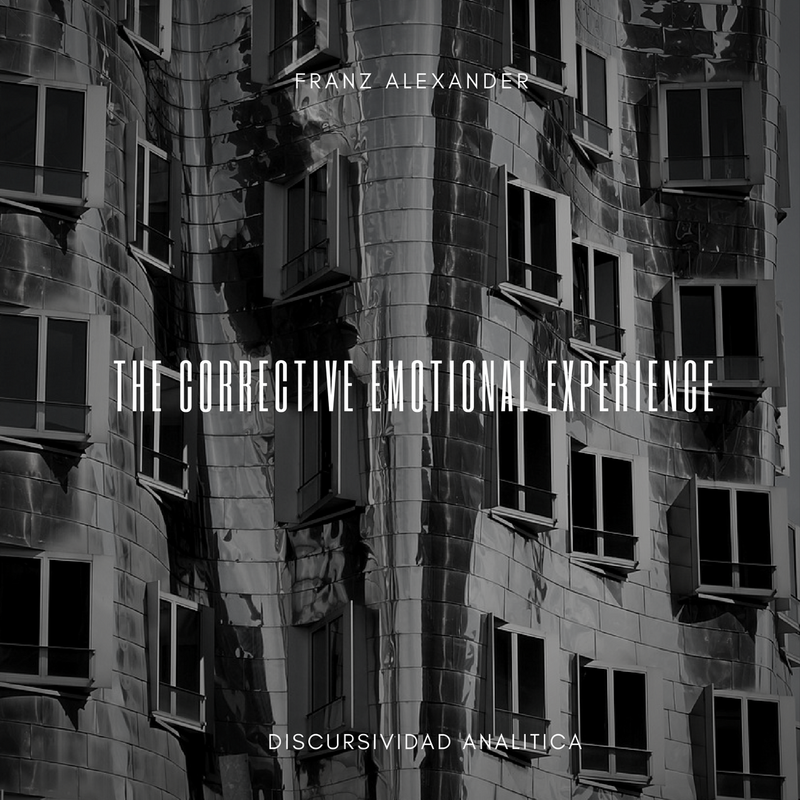 Under the title “The corrective emotional experience” here we include three chapters of the classic book by Franz Alexander, Thomas M. French et al., Psychoanalytic Therapy: Principles and Application (New York: Ronald Press, 1946): chapter 2 (“The development of psychoanalytic therapy”, pp. 13-24), chapter 4 (“The principle of corrective emotional experience”, pp. 66-70), and chapter 17 (“Conclusions and outlook”, pp. 338-341). The three chapters were written by Franz Alexander (the other collaborators of the book were Catherine Lillie Bacon, Therese Benedeck, Rudolf A. Fuerst, Margaret Wilson Gerard, Roy Richard life and intellectual biography. Franz Alexander (1891-1964) was born in Hungary, where his father, Bernard, was a professor of philosophy at the University of Budapest, an illustrious Shakespearean scholar who conveyed to his son a deep respect for the power of the intellect. Alexander received his medical degree in 1912, and later was the first graduate of the Berlin Psychoanalytic Institute, where his training analyst was Hanns Sachs. Alexander was one of the most important members of the group often referred to as “the second generation of psychoanalysts”. In 1929 Freud invited him to Vienna as his assistant, but he chose to leave for the University of Chicago where at the same time he was invited to became Professor of Psychiatry. Every summer, though, he visited Freud, who considered him as “his best pupil in the United States”. He was an independent thinker, and his research interests were so wide that it would be too long to list them here. We could mention two main interests: psychosomatics and brief analysis. During his twenty-four years as Director of the Chicago Institute, the psychosomatic research has been the hallmark of this Institute. Alexander developed an important theory of psychosomatics according to which a specific conflict (e.g., dependence) can stimulates those physiological processes which, by corresponding organic predisposition, might lead to psychosomatic illnesses (e.g., duodenal ulcer). He founded the journal Psychosomatic Medicine and may be considered the chief founder of the field of psychological medicine. The ideas contained in this 1946 book by Alexander and French (such as the concept of “corrective emotional experience”) stimulated a critical discussion among the psychoanalysts of the classical tradition of the time. One of the most outspoken critical voices was that of Kurt R. Eissler (The “Chicago Institute of Psychoanalysis” and the sixth period of the development of psychoanalytic technique. Journal of General Psychology, 1950, 42: 103-157): his article is published as a comment to Alexander ‘s 1946 contribution. Before going into a detailed discussion of this new therapeutic: orientation, we shall return to some psychoanalytic experimentations of the past which led up to the present more flexible techniques. Sigmund Freud, the founder of psychoanalysis, was one the great experimenters of all time. He subjected every formulation to the test of new experience with the result that his original theories underwent important changes. A review of the development of the so-called standard psychoanalytic technique will show the ever-changing character of his work, in which distinct phases can be differentiated. When he took up the psychotherapeutic approach to emotionally disturbed patients, Freud was a physician and a neurologist. Accepted medical treatment at that time consisted either in administering drugs or performing a surgical operation. Therapy was then (and often still is) regarded as a procedure in which the physician “does something to” the patient – the classic example being a surgical operation by which a foreign body or a diseased organ is removed. A similar procedure is the giving of an. emetic or a cathartic which brings about a dramatic process in the body leading to cure; or the giving of an injection, as in chemotherapy, by which the invading micro-organism is exterminated. Each of these medical procedures is a circumscribed performance, a therapeutic act which may or may not have to be repeated to bring about the desired effect. The method of psychotherapy first developed by Freud, in collaboration with Breuer, was cathartic hypnosis. As even its name shows, cathartic hypnosis was also considered a dramatic one-act performance, in which the patient got rid of a spiritual foreign body-his repressed traumatic memories and pent-up affects. In hypnosis the ego not only gave up its control over the emotions, but it also abandoned its function of testing reality. The hypnotized patient was asked questions with the purpose of uncovering the origin of his symptoms and of allowing him to discharge his repressed feelings. This discharge of emotion was considered of great therapeutic value and the method was therefore called “cathartic.” Breuer and Freud soon saw, however, that simply discharging emotions did not cure the patient and that the hypnotic. procedure had to be repeated again and again to obtain results. In using this method, Freud made three significant discoveries: (1) that hysterical symptoms have their source in emotional disturbances of the past; (2) that these disturbing events are capable of undergoing complete repression from consciousness; and (3) that although discharge of repressed emotions (abreaction) in hypnosis gives temporary relief, it has no lasting therapeutic vale in itself. This insight into the cause and course of hysterical symptoms induced him to search for therapeutic techniques which would yield permanent results. He argued that since in hypnosis the patient is able to express his emotions only because his conscious personality-or more precisely, his critical faculty is temporarily eliminated, the real therapeutic task must consist in making the conscious personality capable of facing the emotions which were so intolerable that they had to be suppressed. Even a repetition of the hypnotic experience does not improve the ego’s capacity for dealing with the repressed emotions, since in hypnosis the ego is (in a sense) not there. His problem, therefore, was to find a method by which the patient retained the full functions of his conscious mind and yet could be induced to face that which it repudiated. The next step was an experiment with waking suggestion. This can be considered the second period in Freud’s scientific development. Freud would lay his hand on the patient’s forehead and assure him that he could recall the past if he tried. In the history of psychoanalysis this period was of the shortest duration. It is difficult to establish precisely how long it lasted. It started after 1895 and was given up before 1899 when Dora’s analysis was completed (Freud, 1901 ; see Vol. III, p. 13, of the Collected Papers, London: Hogarth Press, 1924). It is certain, however, that after a relatively sbort period Freud learned that he could not, by suggestion alone, force his patients to remember those traumatic events which led to the neurotic condition, to face in themselves what they had not dared acknowledge before. As a result, this phase left the least impression on the therapeutic procedure. Having convinced himself of the futility of a frontal attack, Freud now developed a new strategy-the method of free association. In free association, Freud found a means of unlocking the unconscious mind of the patient while the patient’s consciousness was retained. The patient was required to tell whatever entered his mind without exerting any conscious selectives or applying any logic to the train of thought. What the patient expressed was drawn, therefore, from the whole span of his life experiences-from his thoughts and feelings, fantasies and dreams, of past and present. Dreams became an important source of unconscious material, not only because of their content but also because of the train of associations they aroused. Repressed feelings were ‘ thus allowed to come to the surface in an indirect manner. Freud’s main interest at that time remained focused upon the reconstruction of the pathogenic past. He hoped and expected that, while the patient in his daily interviews was giving expression to his uncontrolled train of thought; he would gradually – almost in spite of himself – recall the events of the past which had disturbed him. The patient’s conscious defense against his repressed emotions Freud tried to eliminate by what he called his “basic rule” – namely, that the patient reveal everything that occurred to him during the interview whether it be painful or embarrassing or seemingly unimportant. The free associations were thus used as a substitute for the direct memory of hypnosis. In hypnosis, however, recollection of repressed events was not used alone to reconstruct etiology but also to discharge those emotions which were linked with the traumatic experiences of the past. When he replaced hypnosis with free association, Freud was-still concerned with the therapeutic importance of the discharge of emotion. He expected the patient to recall the past gradually and, at the same time, to rid himself of the repressed feelings associated with the painful past. Free association differed from cathartic hypnosis in that the patient’s recollections and discharge of emotion took place in small. quantities over a long period, rather than in the more dramatic hypnotic session. At that time, Freud did not see as clearly as he did later that the real therapeutic problem was not merely to make the patient recall a trauma and discharge those emotions connected with it, but rather to produce certain permanent changes in the ego which would make him capable of remembering painful events and dealing with emotional constellations which had previously been unbearable. This he must have sensed without stating it explicitly. One of his reasons for discarding hypnosis was, to be sure, that. not everyone can be hypnotized; we find indications, however, that he saw even then. that ego resistance had to be dealt with by bringing about a permanent change in the ego, not merely by rendering it defenseless through hypnosis. It is in his report on Dora’s analysis, published in 1905 but completed in 1899, that Freud (1901 ) gives his first account of transference – his most important discovery – which provides the most powerful instrument yet found for overcoming the, patient’s resistance to facing disturbing emotional experiences. In this treatment, he was still far from recognizing the full therapeutic significance of the transference phenomenon with all its technical implications. From that time on, however, a consistent development can be observed-. After this discovery, the search for memories – that is to say, the intellectual reconstruction of the patient’s life history-gave place more and more to the utilization, for therapeutic purposes, of the emotional attitudes developed by the patient toward the physician during analysis. The handling of transference manifestations and the patient’s resistance gradually became the center of the therapy. The emotional reaction of the patient toward the analyst Freud called “transference” because he saw that the patient transferred onto the analyst his neurotic behavior patterns that were based on past experiences, that the patient now entertained toward the therapist the same feelings and conflicts he bad had in his childhood toward some person of authority. This re-living of his neurotic past in his relationship to the therapist in the form of an experimental neurosis of the present, Freud called transference neurosis [Footnote: The expression “transference neurosis” was also used by Freud in a different sense, referring to certain types of neurosis like hysteria in contrast to a narcissistic neurosis like the manic-depressive conditions. It is not in this sense that the expression is used in this book]. The transference neurosis is a milder edition of the patients real-life neurosis, of which he is cured step by step in the analysis. In the transference phenomenon, Freud recognized the same principle so well known in immunology. The organism, receiving small quantities of injected toxins or bacteria, develops defenses against them. These antibodies enable the organism to protect itself against the invasion of the original toxins and bacteria when re-exposed to infection. In the transference neurosis, the patient learns to deal with small quantities of the same emotional tensions which be could not master in the past and against which he could defend himself only by repression, by excluding the intolerable emotions from consciousness. After Freud recognized that all the deeply ingrained emotional patterns of the patient the whole infantile nucleus of his personality, gradually came into free expression during the treatment as the defenses against them were overcome, the transference neurosis as a dynamic reenactment of the pathogenic past became the basis of modern psychoanalytic therapy. Later, as we shall see, transference analysis transformed therapy into a methodical training of the ego, gradually enabling the patient to, deal with conflictful psychological situations which he had avoided before on account of carlier traumatic experiences. Although both principles-the old etiological reconstruction of the past, and the newer analysis of transference manifestations-continued side by side in theory and practice, their mutual relationship was not fully clarified f or a long time. After Freud’s discovery of the significance of the transference, it took about fifteen years for psychoanalytic therapy to emancipate itself from the formulations based on the one-act drama, cathartic hypnosis, and become transformed into a procedure aimed at achieving permanent changes in the ego’s functional capacity by a slowly progressing emotional training – more an educational process than a therapy in the original sense. This transformation is not yet complete. The present-day standard technique, and particularly our therapeutic attitudes and thinking, still display many features which belong to the earlier phases. The main purpose of this book is to hasten this transformation and to encourage the development of more pertinent forms of psychotherapy. Arena of psychotherapy. Some analysts still work on the assumption that the curative process takes place mainly on the couch, the doctor by his interpretations performing a “therapeutic act” upon the patient. They have not yet fully appreciated the significance of the fact that psychoanalytic treatment is a part of the patient’s ego development. For the most part, this assumption that the therapeutic process is confined to the couch is an uncritical carry-over from the past. Any psychodynamically well-trained therapist (should he seriously try to figure out the therapeutic significance of the events in the patient’s daily life) would agree that under the influence of the emotional and intellectual experiences on the couch, the patient becomes capable of having beneficial experiences in his life-at his office with his colleagues, superiors and inferiors; with his wife or his lover; with his children-and that the therapeutic achievements result in part from these life experiences. Although we are still influenced by the dramatic curative happenings of the hypnotic sessions, common sense requires every sound therapist to reckon with the effect of the patient’s daily life and, if absolutely necessary, to; interfere. Many practitioners, however, consider it a “practical compromise” and not a desirable part of the treatment to offer any direction to the patient in regard to his daily life. Consequently, a divided attitude has developed: as a scientifically trained therapist, the physician feels he should center his whole attention on the interviews; as a man of common sense, he knows he must guide the patient’s daily activities to some degree. The common failure lies in not making this guidance an integral part of the whole treatment. The analytic sessions may be considered catalytic agents, speeding up and making possible new relationships and experiences. The influence upon the ego of these experiences of daily life is as great as and often much greater than that of the interviews. Having the courage of one’s convictions and speaking up in the office for the first time may be the beginning of a profound change in a patient’s capacity for self-assertion which had been inhibited by a suppressive home atmosphere in his early childhood. Although this becomes possible only through the experience of the analytic interviews and follows the first successful self-assertion of the patient toward the therapist, the therapeutic influence of such an actual experience is much greater than that of the interviews themselves which are but a “shadow play” of real life. The practical consequences of the assumption that the therapeutic process is confined to the interviews, are enormous. It is responsible for many unjustifiably prolonged treatments, for the unnecessary insistence upon daily interviews when weekly interviews may suffice or may be preferable. It is responsible for our fear of interrupting the treatment, even at the right moment. It is responsible for our not clarifying one of the most general experiences of psychoanalytic therapy-the mysterious post-analytic improvement. This orientation is also responsible for not recognizing those phases in psychoanalysis when daily interviews become detrimental to the cure, giving the patient an excuse for avoiding experiences in life and substituting for them the safe experiences of the analytic sessions. SIGNIFICANCE OF RECOVERED MEMORIES. The belief that the recovery of memories is, in itself, one of the most important therapeutic factors, is still held by many psychoanalysts and in a sense can be considered to be a residue of the period of cathartic hypnosis. The persistent emphasis upon intellectual reconstructions of memory gaps can possibly be traced back to the relatively short period of waking suggestion; but it was the still greater emphasis during the free association phase on the intellectual understanding of the past that made psychoanalytic treatment almost synonymous with genetic research. As a result, the filling in of memory gaps became crystallized as the therapeutic goal of psychoanalysis. This exaggerated emphasis has long hampered both the understanding of why patients remember repressed events and the correct evaluation of their therapeutic significance. It was not until 1930 that the recovery of memories was demonstrated to be not the cause of therapeutic progress but its result, and that recollection of repressed childhood memories occurs, as a rule, only after the same type of emotional constellation has been experienced and mastered in the transference situation (Alexander, 1930). All repressions follow the pattern set up by the child when he first repressed painful emotions his weak and inexperienced ego could not cope with. Recently repressed emotions are more easily recaptured than the corresponding infantile material. When the patient has learned to accept recently repressed material that has been brought to consciousness within the transference relationship, his ego becomes more permeable and he is enabled to recover earlier memories of the same emotional coloring, with which his mature ego can now contend successfully. The real therapeutic accomplishment consists in the patient’s successful mastery in the transference relationship of a previously unbearable emotional conflict. Remembering the original traumatic experience may be considered an indicator of progress. The fact that the patient can now remember something he could not before, simply shows that his ego’s capacity to face a certain type of unbearable emotional constellation has been increased through the treatment. “From the repetition-reactions which are exhibited in the transference, the familiar paths lead back to the awakening of the memories, which yield themselves without difficulty after the resistances have been overcome” (Freud S., Collected Papers, Vol. II, p. 375. London: Hogarth Press, 1924). It is unfortunate that this isolated remark of Freud’s was not developed earlier and in greater detail, with all its significant consequences for therapy. The recovery of memories is not only a barometer of progress indicating the -ego’s increased ability to face repressed emotional situations; it has the additional therapeutic value of helping the patient learn how to discriminate between the past and the present situation. For example, a patient’s early manifestations of aggressiveness have been intimidated by a father who required complete submissiveness from his son. As a result (following the principle of “spreading” or generalization of emotional reactions) the patient has become inhibited in all situations in which he faces a person of authority. By reviving the past emotional reactions toward the father, we enable the patient to develop the power to differentiate between the original childhood situation and his present status. He will then realize that he is no longer helpless and can afford to resist the oppressive attitude of others. The principal curative powers of this treatment, however, lie in the fact that he can express his aggressiveness toward the therapist without being punished, and can assert himself without being censured. This actual experience is needed before the patient gains the emotional perception that he is no longer a child facing an omnipotent father. This type of emotional experience as it occurs during treatment, we call “corrective emotional experience” and we consider it the most important factor in all uncovering types of therapy. It is not necessary – nor is it possible – during the course of treatment to recall every feeling that has been repressed. Therapeutic results can be achieved without the patient’s recalling all important details of his past history; indeed, good therapeutic results have come in cases in which not a single forgotten memory has been brought to the surface. Ferenczi and Rank were among the first to recognize this principle and apply it to therapy. However, the early belief that the patient “suffers from memories” has so deeply penetrated the minds of the analysts that even today it is difficult for many to recognize that the patient is suffering not so much from his memories as from his incapacity to deal with his actual problems of the moment. The past events have of course prepared the way for his present difficulties, but then every person’s reactions are dependent upon behavior patterns formed in the past. Merely remembering an intimidating or demoralizing event does not change the effect of such an experience. Only a corrective experience can undo the effect of the old. ‘Fhis new corrective experience may be supplied by the transference relationship, by new experiences in life, or by both. A genetic reconstruction of the past is less important for the patient than for the physician; to him it is essential because only in the light of the past will he be able to understand and interpret the meaning of the patient’s transference behavior. It is on this understanding that he bases his treatment and helps the patient to find a better and happier way to live. We have given this brief outline of the history of basic psychoanalytic principles in order to show the logical development of our flexible approach to psychiatric problems. It is by no means a comprehensive statement of the history of psychoanalysis from Freud to the present. If it were, many more names would have to be included to show their influence on the growth of this discipline. In historical perspective, our work is a continuation and realization of ideas first proposed by Ferenczi and Rank (1924). They advocated an emphasis upon emotional experience instead of intellectual genetic understanding of the sources of the patient’s symptoms. They held that emotional experience should replace the search for memories and intellectual reconstruction. At the same time, they proposed another radical departure from the usual procedure by setting a date of termination for treatment. In this respect also, they were groping in the right direction; unfortunately, they did not draw the correct technical conclusion (as to termination) from their correct evaluation of psychoanalysis as a kind of emotional training. Enforced termination was not a method which cold be used successfully in the majority of cases and, because of this one faulty technical generalization, the many valid parts of Ferenczi and Rank’s contribution did not find adequate recognition. The briefest of historical outlines would be incomplete without some mention of the work of Jung and Adler, both of whom were associated with Freud in the early days of psychoanalysis. Each developed a school of his own and each has made well-known contributions both to psychodynamic theory and to psychotherapeutic techniques based on psychodynamic principles which it would be of interest to discuss if only space permitted. A review of the literature in the field of psychoanalytic therapy of the last decade would reveal a large body of ideas and observations similar in direction to the views expressed in this book. Of the more recent contributions, the work of Oberndorf (1942) comes nearest to the orientation of this study. To give anything like an adequate account of recent work in this field would go far beyond the limits set for this volume. In all forms of etiological psychotherapy, the basic therapeutic principle is the same: to reexpose the patient, under more favorable circumstances, to emotional situations which he could not handle in the past. The patient, in order to be helped, must undergo a corrective emotional experience suitable to repair the traumatic influence of previous experiences. It is of secondary importance whether this corrective experience takes place during treatment in the transference relationship, or parallel with the treatment in the daily life of the patient. The simplest example of such a corrective, experience is offered by the procedure called narcosynthesis. The patient in narcosis re-lives in fantasy the dangers of combat which he had been unable emotionally to master in reality. Because the narcotic and the presence of the therapist in whom he has confidence reduce the intensity of his anxiety, the patient becomes more capable of facing the situation to which he had succumbed. The character of the transference relationship is unique in that the patient has an opportunity to display any of a great variety of behavior patterns. It is important to realize that the mastery of an unresolved conflict in this relationship becomes possible, not only because the transference conflict is less intense than the original one, but also because the analyst assumes an attitude different from that which the parent had assumed toward the child in the original conflict situation. While the patient continues to act according to outdated patterns, the analyst’s reaction conforms strictly to the actual therapeutic situation. This makes the patients transference behavior a one-sided shadow-boxing, and thus the therapist has an opportunity, to help the patient both to see intellectually and to feel the irrationality of his emotional reactions. At the same time, the analyst’s objective, understanding attitude allows the patient to deal differently with his emotional reactions and thus- to make a new settlement of the old problem. The old pattern was an attempt at adaptation on the part of the child to parental behavior. When one link (the parental response) in this interpersonal relationship is changed through the medium of the therapist, the patient’s reaction becomes pointless. In the formulation of the dynamics of treatment, the usual tendency is to stress the repetition of the old conflict in the transference relationship and to emphasize the similarity of the old conflict situation to the transference situation. The therapeutic significance of the differences between the original conflict situation and the present therapeutic situation is often overlooked. And in just this difference lies the secret of the therapeutic value of the analytic procedure. Because the therapist’s attitude is different from that of the authoritative person of the past, he gives the patient an opportunity to face again and again, under more favorable circumstances, those emotional situations which were formerly unbearable and to deal with them in a manner different from the old. This can be accomplished only through actual experience in the patient’s relationship to the therapist; intellectual insight alone is not sufficient. It is, however, vitally necessary’ for the therapist to have a clear understanding of the genetic development of the patient’s emotional difficulties so that be may revive for the patient the original conflict situations from which he has retreated. The patient’s intellectual understanding of the genetics has only an accessory significance. The more precisely the therapist understands the dynamics and is thus able to reactivate the early attitudes, the more adequately can he provide, by his own attitude, the new experiences necessary to produce therapeutic results. A completely neutral psychoanalyst does not exist in reality, nor wold he be desirable. While it is necessary that the therapist maintain an objective, helpful attitude at all times, within this attitude lies the possibility of a great variety of responses to the patient. Spontaneous reactions to the patient’s attitudes are frequently not desirable for the therapy, since they may repeat the parents’ impatience or solicitude which caused the neurosis and cannot, therefore, constitute the corrective experience necessary for cure. Jean Valjean did not know why he had robbed the boy. He felt clearly, however, that “if he were not henceforth the best of men he would be the worst, that he must now ascend higher than the bishop or sink lower than the galley-slave, that if he wished to be good he must become an angel, and if be wished to remain wicked that he must become a monster.” Here the author interrupts his dramatic narration and goes into a psychodynamic discussion of Valjean’s emotional processes in an attempt to explain his sudden conversion. HUGO’s DYNAMIC PERCEPTION. Were it not for the episode with Gervais and Hugo’s – psychological explanation of Valjean’s emotional state, the story of Valjean’s conversion would not deserve our attention. The scene with the bishop which demonstrates the effect of kindness upon unfortunate and maltreated pariahs is anything but novel. The encounter with the boy, however, shows not only that Hugo instinctively understood the emotional metamorphosis but also that he was acquainted with the dynamic process in all its details. Hugo shows us explicitly-and no better explanation could be given today-why Valjean behaved in such an inhuman manner toward little Gervais, robbing the helpless boy just after he had been overwhelmed by the bishop’s generosity. Hugo understood that the bishop’s act was a violent attack upon Valjean’s precarious emotional equilibrium, which consisted in being cruel toward a cruel world, and Hugo saw that Valjean in response had to reestablish his balance in a spiteful insistence upon being bad. In this, Hugo describes an experience well known in psychoanalysis; that whenever a symptom or neurotic attitude is attacked by the treatment, a recrudescence of the symptom usually occurs before the patient is able to give it up altogether. The experienced psychoanalyst knows this storm before the calm, this exacerbation of the morbid condition which precedes improvement, and he watches with eager expectation for its occurrence. MODEL OF BRIEF PSYCHOTHERAPY. We might question that one favorable experience could undo the cumulative effects of lifelong maltreatment. We are justified, however, in assuming that Valjean, although a hardened criminal, had a conscience which was rendered ineffective only by the hardships of his emotional development. He had to emphasize to himself his adverse fate in order to feel free to act destructively. This equilibrium was disturbed by the bishop’s unexpected and extraordinary kindness. Valjean’s conversion took place within a few hours; it is a model of brief psychotherapy. This masterpiece of psychodynamic analysis was written in 1862, about sixty years before Freud introduced his concept of the super-ego and its compelling influence upon human behavior. The work set forth in this volume is a logical continuation of a trend in psychotherapy which began with Freud’s discovery of the phenomenon of transference as the dynamic agent of the curative process. Expressed more concretely, the main therapeutic result of our work is the conclusion that, in order to be relieved of his neurotic ways of feeling and acting, the patient must, undergo new emotional experiences suited to undo the morbid effects of the emotional experiences of his earlier life. Other therapeutic factors – such as intellectual insight, abreaction, recollection of the past, etc. – are all subordinated to this central therapeutic principle. Re-experiencing the old, unsettled conflict but with a new ending is the secret of every penetrating therapeutic result Only the actual experience of a new solution in the transference situation or in his everyday life gives the patient the conviction that a new solution is possible and induces him to give up the old neurotic patterns. By repetition, these corrected reactions gradually become automatic; the ego accepts the new attitudes and integrates them into the total personality. It is thus that therapeutic results become consolidated. In the patient-physician relationship, the therapist has an unique opportunity to provide the patient with precisely that type of corrective experience which he needs for recovery. It is a secondary question what technique is employed to bring it about. The standard psychoanalytic technique is only one – and not in every case the most suitable one – of the many possible applications of fundamental psychodynamic principles that can be utilized for this kind of emotional training. Moreover, every therapy which increases the integrative functions of the ego (through re-exposing the patient under more favorable conditions to those conflicts which have before been met with neurotic defense mechanisms) should be called psychoanalytic, no matter whether its duration is for one or two interviews, for several weeks or months, or for several years. One of the most significant practical results of our study is the clear recognition of certain definite disadvantages in any routine procedure. just as a strain of bacteria may adapt itself to the drug. being used for its extermination and become sulfa- or penicillin-resistant, so neurotic mechanisms often adapt themselves to a standardized technique and thus rob it of its therapeutic effectiveness. The result may be an “interminable” transference neurosis in which the patient replaces his old disturbance with a neurotic relationship to his doctor which gradually loses most of its suffering and retains chiefly a morbid gratification-thus becoming a new method of evading those problems in life from which he retreated by means of his neurotic symptoms. Only by constantly counteracting the patient’s regressive tendencies and changing the routine procedure can this most vulnerable feature of the standard psychoanalytic technique be annulled. In this connection it is important’ to remember that the patient’s new emotional experiences are not confined to the therapeutic situation; outside the, treatment he has emotional experiences which profoundly influence him. The corrective emotional experiences within the transference situation enable the patient to endure or to meet successfully life experiences which he had been unable to face before, and the influence of the treatment is itself reinforced by each such success. A proper coordination of life and therapeutic experiences is the basis for determining when a change in the frequency of the interviews or an interruption of treatment is necessary. At a certain phase in every treatment it will be desirable to have the patient translate into his actual life experience his newly acquired reaction patterns without the support of the therapist. In such a phase an interruption, long or short, is indicated. All this can be summarized as the principle of flexibility in treatment: the application of the technique best suited to the nature of the case [Elsewhere in the book (ch. 1, p. 6), Alexander states: “Among these modifications of the standard technique are: using not only the method of free associations but interviews of a more direct character, manipulating the frequency of the interviews, giving directives to the patient concerning his daily life, employing interruptions of long or short duration in preparation for ending the treatment, regulating the transference relationship to meet the specific needs of the case, and making use of real-life experiences as an integral part of the therapy” (Note of the Editor)]. This principle of flexibility opens for psychoanalytic therapy new possibilities of great social significance. Originally, psychiatry dealt almost exclusively with the custodial care of advanced cases of psychosis. With greater psychological understanding of the nature of mental disturbances came the development of the practice of psychiatry in offices and out-patient clinics. These cases, well-diagnosed forms of severe chronic psychoneurosis, were ambulatory patients who continued to live in their usual environment during a prolonged treatment of almost daily interviews. We can now extend the scope of rational psychotherapy to include an even greater number of maladjusted persons, to include not only many severe psychoneurotics who have been unable to benefit from the standard technique (because of insufficient time or money) but also that even greater group-the acute, the mild chronic, and the incipient psychoneurotics. As a result of the gradual extension of the scope of psychiatry in general, the understanding of the nature and methods of psychiatry and of the functioning of the human personality is becoming a part of contemporary public knowledge. Mental illnesses, which until recently were little understood and were therefore an open field for conjecture and superstition, are gradually losing their stigma and yielding to a more reasonable point of view. Already it is becoming a natural part of everyday life to consult a psychiatrist when the occasion arises, just as one 1yould consult any other specialist, and it no longer need be shrouded in shameful secrecy. The development of bacteriology, the knowledge of disease-curing germs, became the foundation of public hygiene and, by preventing the periodic extermination of the population through epidemics, made congested living in large cities possible. Contemporary man now faces a problem of, if possible, even greater magnitude: the problem of, living together harmoniously in a highly differentiated civilization. The majority of mental disturbances are failures of adjustment by the individual to social living-an adjustment which is becoming more and more difficult in this era of transition wherein social values and standards are so rapidly changing. Harmonious emotional adjustment has thus become a problem for the large majority of the population. Here lies the most vital function of psychotherapy: to give rational aid to all those who show early signs of maladjustment. A flexible approach, based on sound general principles of psychodynamics and adjustable to the great variety of those in need, is therefore a pressing necessity of our day. The progress of psychiatry in the past bas been characterized by the gradual improvement of mental hospitals. The new development will come to expression in the creation of well-staffed out-patient clinics where the large number of incipient cases – all those whose emotional balance bas been impaired through the complex human relationships in our fluid, ever-changing and highly differentiated society – will receive rational, dynamic psychotherapy. Aichhorn A. (1925). Verwahrloste Jugend. Leipzig: Internationaler Psychoanalytischer Verlag (trad. ingl. : Wayward Youth. New York: Viking Press, 1935; trad. it. : Gioventÿ traviata. Milano: Bompiani, 1950). Alexander F. (1930). Zur Genese des Kastrationskomplexes. Internationale Zeitschift für Psychoanalyse, 1930, XVI Band (English transl. by C.F. Menninger: Concerning the genesis of the castration complex. Psychoanalytic Review, 1935, XXII, 1). Ferenczi S. & Rank O. (1924). Entzvicklungsziele der Psychoanalyse. Wien: Internationaler Psychoanalytischer Verlag (English transl. by Caroline Newton: The Development of Psychoanalysis. New York: Nervous and Mental Disease Publishing Co., 1925). Freud S. (1895). The psychotherapy of hysteria. In: Breuer J. & Freud S., Studies on Hysteria (1892 -1895), Chapter IV. Standard Edition, 2: 253-306. Freud S. (1901 ). Fragment of an analysis of a case of hysteria [Dora’s case]. Standard Edition, 7: 7-124. Hugo V. (1862). Les Miserables (Italian transl. : I miserabili. Milano: Mursia, 1958-1970). Oberndorf C.P. (1942). Factors in psychoanalytic therapy. American Journal of Psychiatry, 98: 750.